Over the weekend, the Detroit Red Wings announced that both Darren Helm and Niklas Kronwall would be returning to the lineup soon. 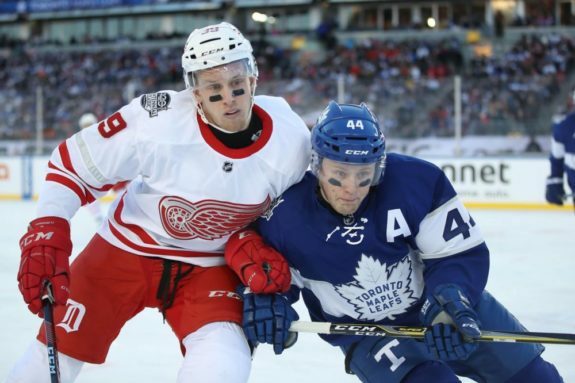 While their improving health certainly comes as good news, welcoming back Helm and Kronwall also requires the Red Wings to make a few, possibly headache-inducing roster moves. Because Helm and Kronwall are on the injured reserve list, the Red Wings have been able to carry 23 players on their roster. But before they can be activated, two players will have to be sent down to Grand Rapids in order for the Red Wings to comply with NHL rules. Who though? Per Cap Friendly, only three skaters can be assigned to Grand Rapids without requiring waivers: Anthony Mantha, Andreas Athanasiou, and Dylan Larkin. It just so happens those players are carrying the Red Wings right now. Because Nick Jensen dressed for his 10th game this season Saturday against Pittsburgh, he now requires waivers to be sent down. Detroit has already lost Martin Frk and Teemu Pulkkinen via waivers this season (and were lucky enough to reclaim Frk later on). When Helm and Kronwall return, the Red Wings will have to risk another two players again. Who will be put at risk this time? Based on recent play (or lack thereof), Tomas Jurco may be on the chopping block. The former second-round pick has only skated in 11 games this season and has not registered a point. But would the Red Wings risk losing the 24-year-old knowing fellow youngsters Frk and Pulkkinen were snatched up earlier this year? Even though he’s been effective in his role lately, Drew Miller could be sent down. He’s a one-dimensional player that Helm could replace in the bottom six. Steve Ott could also take over Miller’s role if the Michigan State alum heads west to Grand Rapids. Ott’s contract allows the Red Wings to send him down without cap implications, but the hard-nosed grinder has earned his stay with a decent season so far. Ott has been fantastic in the faceoff circle for Detroit and does the little things right on the ice. On defense, Jensen could be sent down, but has impressed lately. His waiver-eligibility-breaking game against Pittsburgh was possibly his best of the season. Plus, Jensen has a right-handed shot and can wheel up and down the ice. Like Ott, Jensen deserves to stay. Ryan Sproul started out well for the Red Wings, but has made a few too many defensive blunders when in the lineup lately. Regardless, Sproul has a much-coveted right-handed shot and offensive instincts. Are Sproul’s mistakes enough to send the rookie down knowing there’s a high probability another team will claim him? Already under scrutiny from the fans and media for odd roster moves and contracts that might be too long, Ken Holland will have to make a couple of difficult decisions when Helm and Kronwall are ready to go, barring more injuries. Will he send down veterans on their way out or young players with promise yet to fulfill? Who should the Detroit Red Wings demote when Helm and Kronwall return? Comment below with your picks.